The game of ping pong, also known as table tennis, is typically a fast-paced game that requires cat-like reflexes and a superior knowledge of the various angles of the table—and how those angles can play into your favor. If you are looking to become a ping pong champion, somebody who can confidently take on all challengers, the following tutorial may prove very useful to you. Here we will discuss the game of ping pong in great detail, and highlight some useful strategies that are commonly employed by some of the world’s best players. We will also speak to some of the mental aspects of the game, and show you how to develop a winning way of thinking that can ultimately help you master all the skills that make certain table tennis players rise above the competition. Ping Pong, also known as table tennis, is a sport in which two (singles) or four (doubles) players compete by hitting a small and very lightweight ball back and forth using small bats known as paddles. It is officially known as table tennis because it closely resembles the actual game of tennis, only instead of being played on a court the game is played on a hard table that is divided by a net. Like with regular tennis, the table used to play ping pong is divided vertically by a line. The play of ping pong, especially at the highest levels, is very fast and demands ultra quick reaction times. The sport of ping pong is played all around the world, and for decades now (since 1988) has even been part of the Summer Olympic Games. The sport is governed by a global organization known as the International Table Tennis Federation (ITTF), which was founded way back in 1926. The federation currently includes over 225 member associations. The game of table tennis was invented in the late 1880s as game manufacturers tried to capitalize on the popularity of lawn tennis. Many different manufacturers had their own version of table tennis, but it wasn’t until the year 1890 that ping pong as we know it today was initially played. Around the turn of the 20th century, the English game manufacturer Jon Jaques and Son were manufacturing the first table tennis sets and popularizing the game. These early sets included a lightweight plastic ball and small paddles with Velcrum stretched over an outer casing (similar to a small drum) and attached to a handle. These early paddles gave rise to the name ping pong, which was derived from the different sounds made by different sized rackets. Before we get into some of the winning strategies for ping pong, let us first take a look at how the game is played. Ping pong is a game that is played and scored much like actual tennis. 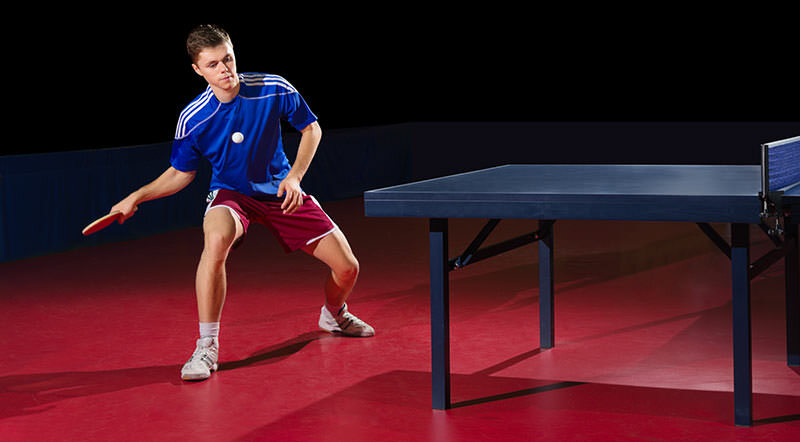 In singles play, two players stand on opposite ends of the table, and the ball is hit back and forth until one player misses the ball, hits it into the net, or hits it out of bounds—or off the table. These eventualities cause a point to be scored by your opponent. The game continues to be played in this way until one player reaches either 21 points or 11 points—depending on the variation of ping pong being played. Typically, a coin flip or rally is initiated at the beginning of a ping pong match to see who will serve first. In regulation ping pong, the player serving the ball is required to begin the serve by holding the ball in the palm of his non-racket hand. From there the ball is thrown upwards, and before it hits the table it must be hit by the server’s racket, bounce on the server’s side of the table, clear the net on a single bounce, and land somewhere on the opponent’s side of the table. If any one of these things does not happen, it is called a fault and the receiver of the serve is awarded a point. If the ball hits the net and then lands on the receiver’s side of the table, this is called a “let” and the serve is repeated. Player A will continue to serve until a total of five points have been scored (by either side or through a combination of both players’ points). After the serve, players are required to hit the ball back and forth to each other. Once the ball bounces on their particular side of the table, they must hit the ball back over the net, making sure it bounces on their opponent’s side of the table. This is continued until one player hits it off the table or into the net. Long serve. With a long serve, you will try to get the ball to bounce on your opponent’s side of the table very close to the backline—also known as the deadline. However, if you try to get it too close to the end of the table you risk hitting a fault and the loss of that point. Instead, aim for about 6 inches in front of the deadline. This strategy will help back your opponent off the table and make it much more difficult to hit a good quality return. Short Serve. After you have served up a couple long serves in a row, your opponent will no doubt be waiting for another one, perhaps even setting his position to smash your serve as it comes. To counter this, you can go with a short serve instead. With a short serve, you are trying to catch your opponent off guard when he is standing back and away from the table. With this serve, you are trying to just barely clear the net with a very low shot. The goal of this serve is to have the ball bounce twice on your opponent’s side of the table before he has a chance to reach it. Backspin Serve. Serving with a degree of backspin is another great technique that can keep your opponent guessing. Backspin balls have the tendency to stop or backup when they hit your opponent’s side of the table, making it very difficult to hit an effective return. To hit the backspin serve, allow the ball to get very near to the table on its downward descent. Then, just before it hits, cut under it with a slicing motion and hit the base of the ball. There are many times in the course of a ping pong game that your opponent will catch you out of position with a good serve, return or volley. This is just the nature of the game. However, instead of trying to pull off a next-to-impossible return when caught out of position, you can utilize the shot known as the lob—a shot that will buy you some extra time to get back into position and ready yourself for your next shot. To hit a lob, you are essentially using a scooping motion rather than a hitting motion. As the table tennis ball descends, position your racket directly underneath the ball, and push it out and upwards towards your opponent’s side of the table. You may not always be successful with this shot, but when you are caught out of position and away from the table, it gives you a much better chance to win that point than any other shot in your arsenal. Ping pong can be a mentally draining sport, especially when points drag on for several seconds at a time, requiring you to remain focused on each return and stroke of the ball. Because of this, you will need to develop a good mental game to be consistently successful. As with the physical side of ping pong, the mental aspects of the game take hours of training to perfect. Try to plan each training session with a particular goal in mind, and then execute and track your results. Here are just two basic exercises that can help you strengthen the mental side of your game. Deuce Mockups. On each day of practice, take some time to create mockup games that begin at deuce to simulate the pressure of the game. Third and Fourth Shot Drills. At practice, start to initiate third and fourth ball attack drills—drills in which both you and your practice partner are required to win a point within a pre-determined number of strokes. By following these simple tips, your ping pong game should begin to improve gradually day by day, and within no time you’ll be winning far more matches than you lose.